Bancroft Ontario, Canada - November 20, 2010. Antoine L’Estage and his co driver/partner Nathalie Richard capped off one incredible year in rally by clinching the 2010 CRC driver and co-driver titles. The victory completes their Triple Crown year. Antoine is one of only two drivers to ever clinch all three championships in a single year: Rally America, North American Championship and the Canadian Rally Championship [CRC]. Standing in Antoine’s way was his long-time rival Pat Richard, also the only other driver to achieve the Triple Crown, which he captured back in 2004. 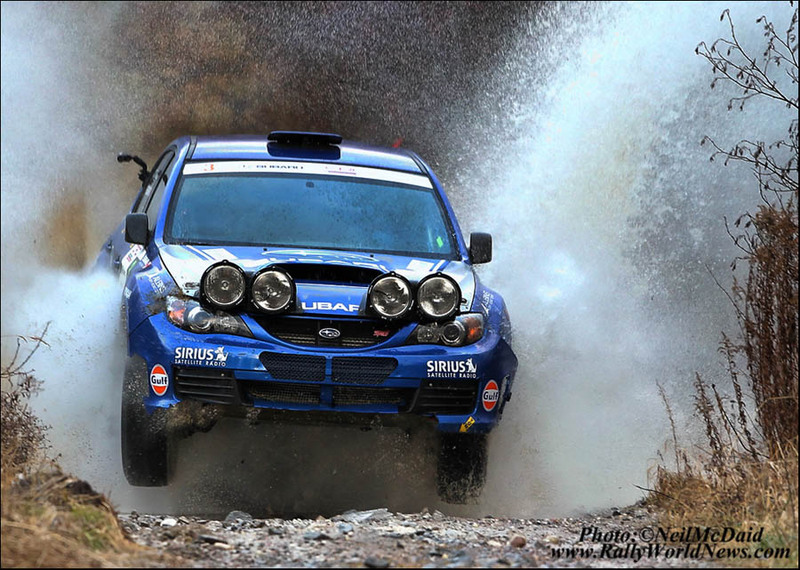 Weather conditions at Rally of The Tall Pines [ROTP] will keep you guessing right down to the day of the rally. Notorious for snow, ice or a mix of both, teams will usually bring every possible tire option they have just in case. In the weeks and days leading up to the event, organizers put in a considerable effort to make much needed repairs to several of the stages. Materials were added and stages were graded where needed. Talking with several drivers as they returned from recce on Friday, we asked if they had any concerns about the ice we saw on the stages during our own recce. Most were quick to point out how thrilled they were with the general condition of the stages. They felt the ice was not major and would quickly clear as the first cars passed. The rally would get underway Saturday morning after the ceremonial start at the Dungannon recreation center outside of Bancroft. Antoine L’Estage would be first on the road, SS1-Upper Hastings, a stage thought by many to be one of the best stages in the rally and, for sure, a top 10 stage in the championship. It’s a driver stage with big crests and sweeping turns and one loose uphill hairpin thrown in for good measure. L’Estage would attack hard on this first test. Making his intentions known early, he set a blistering time that was a full 9 seconds faster than Pat Richard. Richard would answer the call on SS2, which was a rerun of SS1, by matching Antoine to the second. Antoine and Nathalie’s decision to go all out on SS1 was the right choice as times had dropped by 5 seconds on the second pass over the much looser surface. 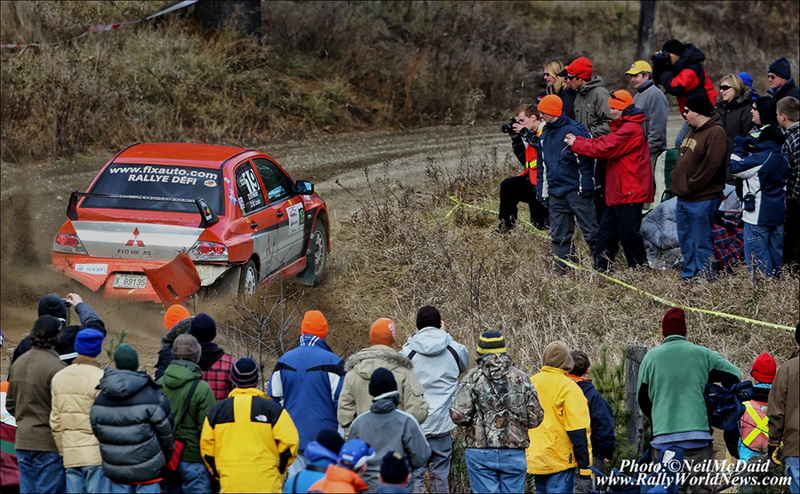 Team Subaru Canada entered a second car just days before the start of the rally in an effort to secure the manufacture’s title. Behind the wheel was PWRC driver Martin Rowe who now resides in Canada. To the surprise of many, including myself, Rowe was clearly off the pace on the early stages. His absence from competitive rallying on a regular basis was showing. SS-2 would see the first retirement of the rally. “Crazy Leo” Leonid Urlichich, the wildly popular Russian, would retire after a hard impact. Both Leo and his co-driver Chrissie Beavis would walk away unharmed to race another day. SS3, “The Peanut,” starts on a wide two car forest road, a flowing section of road much like SS1. It twists its way through the trees with big sweeping fast turns over flowing crests. Then the nightmare begins; a square left into hell. The stage narrows to barely a car width while trees and rocks line your way. This test has claimed many front running cars in recent years, most notable Ken Block in 2008. It seems the longer and tougher the stage the more Pat Richard comes into his zone. Pat and co-driver Alan Okewell would set the fastest time on “The Peanut”, clawing back 4 of the 9 seconds lost to L’Estage on SS1. Craig Henderson rounded out the top three some 33 seconds off Richard’s pace to maintain third. The first 3km of SS4, “Old Deltor Spectator,” is somewhat the opposite of “The Peanut.” It starts with a tight technical challenge before it crosses a short tarmac stretch and opens onto wider smoother gravel roads. The stage has a big Finland-style jump as it carves its way towards the first major spectator area of the rally. Like boxers in the ring going toe-to-toe, L’Estage would punch back with the fastest time on SS4. Surprisingly, Richard was 21 second off the pace on SS4, a stage he knows very well. As the cars entered the first major service of the day we would learn that Richard took the jump on SS4 flat out and sustained damage on landing. Richards’ crew would do their best to make the needed repairs within the 30 minute service window, but were unable to do so. Richard was charged with a penalty for late arrival at TC#2-out. L’Estage would continue to add to his lead on SS5 putting another 8 seconds between him and Pat. Although Craig Henderson in his Subaru was nowhere near the pace set by L’Estage and Pat Richard, he was staying within striking distance, maintaining a top three finish on most of the early stages. Bruno Carre was staying with Henderson holding 4th. 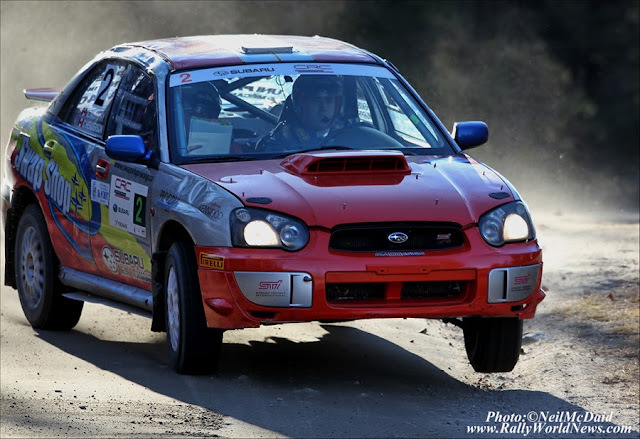 For PWRC Champion Martin Rowe and co-driver Keith Morrison in the second Subaru Canada Rally team car, the 40th running of this historic rally was proving to be a challenge. Getting used to the car and each other, along with some mechanical problems, the duo just never seemed to factor. ﻿L’Estage would claim stage wins on both SS6-7. Despite being down by over two minutes to L’Estage, Pat Richard would throw caution to the wind and go all out over the 27.5 km of SS8, Egan Creek. When the times were compared Pat had bettered Antoine’s time by a whopping 22 seconds. With L’Estage now looking to get the car safely to the finish, he seemed to be backing off the pace somewhat. Pat Richard would continue to push to close the gap on L’Estage and gained the stage victory on SS9, Lower Hastings 1. Not letting the Team Subaru driver get too close, L’Estage would match times with Pat on SS10-Middle Hastings 1. After SS10 the cars would make their way north to the Dungannon central service area before tackling two short stages at the Golton Super Special, SS11-12. Pat Richard posted fastest times on both passes. ﻿Into the final service of the rally, it was nearly a carbon copy of 2009. Antoine had control of the rally lead, Pat was clawing back time from earlier gearbox issues. Three night stages to go, then disaster struck for L’Estage. 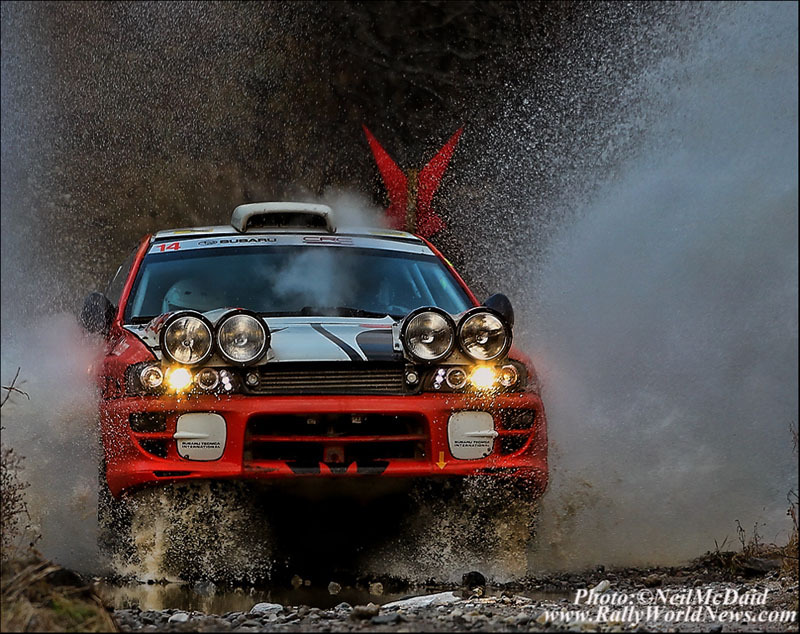 On the final stages of the 2009 Rally of the Tall Pines, Antoine’s car began to develop clutch issues that would eventually strand he and Nathalie at the start of the final stage, therefore handing the win and the 2009 championship to Pat Richard. If any memory of the heartbreaking ending to their 2009 season was on their minds, neither Antoine nor Nathalie were letting anyone know it. With a final blessing from crew chief John Buffum in the service area, a smiling L’Estage jumped into the car exclaiming, “Let’s get this done.” Then they were off into the night for the final three stages in search of a fitting ending to their dream season. Surprisingly, Antoine would take the victory on the second running of Egan Creek, SS13 [B2] and to no one’s surprise Pat would again hit back, taking the victory on SS14 [B3]. The final stage of the rally was a second running over Middle Hastings, SS14 [B4]. All L’Estage had to do was basically drive through, no risk needed. 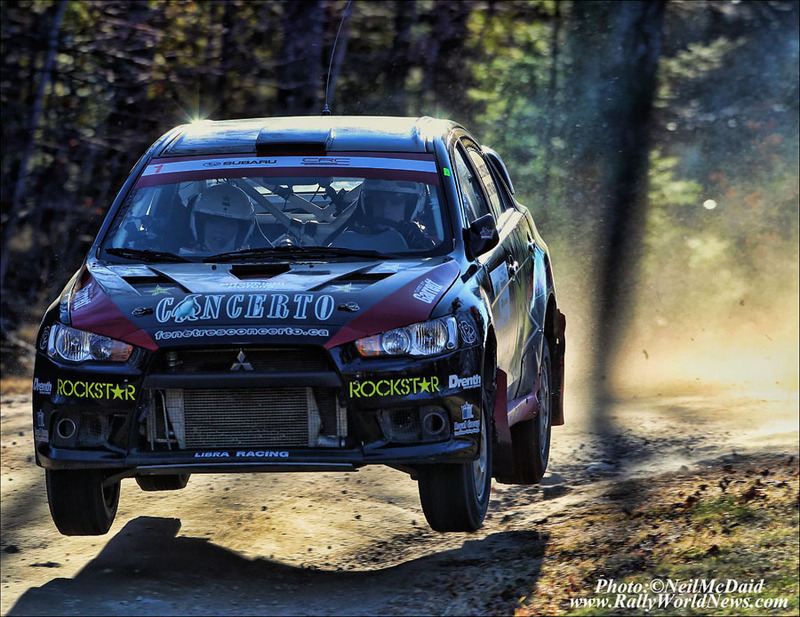 As Antoine and Nathalie approached the final control in their Rockstar Mitsubishi, the relief and emotion of ending this historic year showed on their faces. The rally victory and the Triple Crown honors were theirs. L’Estage had just pulled away from the final control when radio reports started to come in that Pat Richard, who had been running second on the road, was missing on the stage. Craig Henderson was the next to arrive into the final control and reported that Pat and Alan were off on theide of the road, but the “OK” board was displayed. The intense battle of the day and the massive jumps had taken its toll on Richards’ suspension. Component failure just after the start of the stage ended Pat’s charge to the podium. Craig Henderson would now claim second and Bruno Carre finished third overall. A string of faster stage times by Martin Rowe in the late afternoon brought him within one second of grabbing third from Bruno. With Craig Henderson’s podium, Subaru clinched the manufacture’s championship. 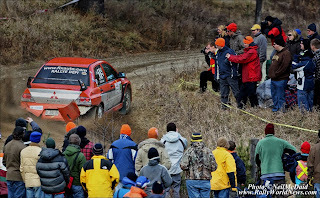 Rally of The Tall Pines closes out the 2010 North American rally calendar……roll on 2011.